That haunt the dusk in ermine capes." Fairly few species of Yponomeutidae occur in Illinois, but these represent several different genera. Yponomeutids are referred to as ermine moths, because adults of many species, especially in the genus Yponomeuta, have white forewings adorned with many small black spots, and this coloration resembles that of ermine fur of the type traditionally used for trim on the robes of European royalty (white fur with many small black tail tips sewn on). Most yponomeutids that can be collected in Illinois are univoltine. Larvae of native species show a proclivity for feeding on plants in the family Celastraceae. 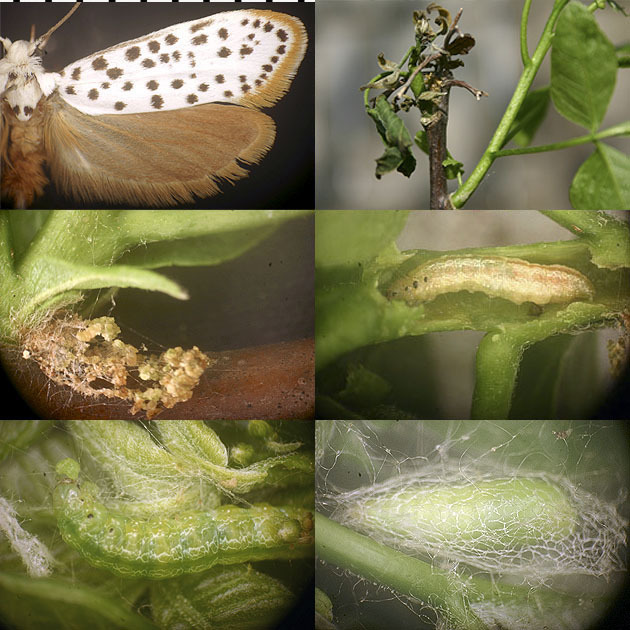 Most species are leaf feeders, and some of them feed communally in webs that can be so extensive as to be problematic when the larvae occur on plants of economic interest (see comments under coverage of the genus Yponomeuta, below). In species that really do belong to this lineage, pupation takes place in a slight silken cocoon that is solid-walled (not meshlike), and overwintering occurs in the adult stage. Adults of most Illinois species of Yponomeutidae are rather large, somewhat broad-winged microleps with "shaggy" head vestiture, by virtue of which they might be confused with Tineidae or Tortricidae. However, yponomeutids never have prominent, folded maxillary palps or bristle-like setae on the labial palps, as are seen in most adult Tineidae (Fig. 1A), and yponomeutid labial palps (Fig. 1C-D), even when they are short and porrect (Fig. 1D), never display a small, clearly-differentiated, knoblike terminal segment, as is characteristic of Tortricidae (Fig. 1B). 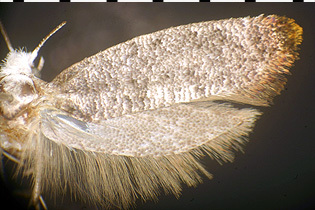 Also, moths in the superfamilies Tineoidea and Yponomeutoidea do not display a chaetosema (or more properly, a pair of chaetosemata, one on either side of the head), whereas members of Tortricidae, along with Lepidoptera of many other families, do (Fig. 1E-F). 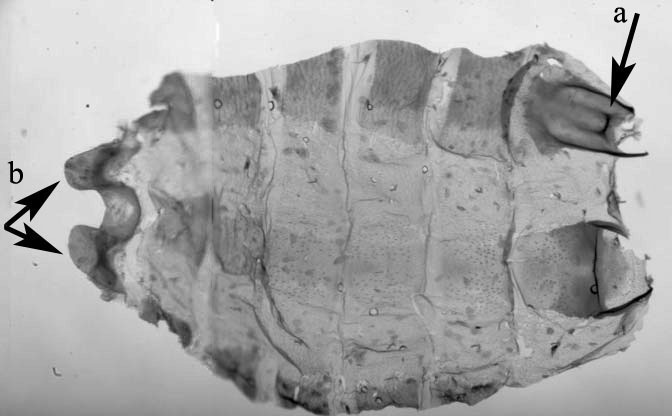 Also, adult yponomeutids, when dissected, display a transverse sclerotized bar on abdominal sternum 2 (apparent sternum 1) in both genders, and pleural lobes on abdominal segment 8 in the male (Fig. 2). These two character states are diagnostic for the superfamily Yponomeutoidea and are never seen in Tineidae or Tortricidae. Figure 1. Heads of microlepidoptera; A-D, ventral aspect; E-F, left lateral aspect. 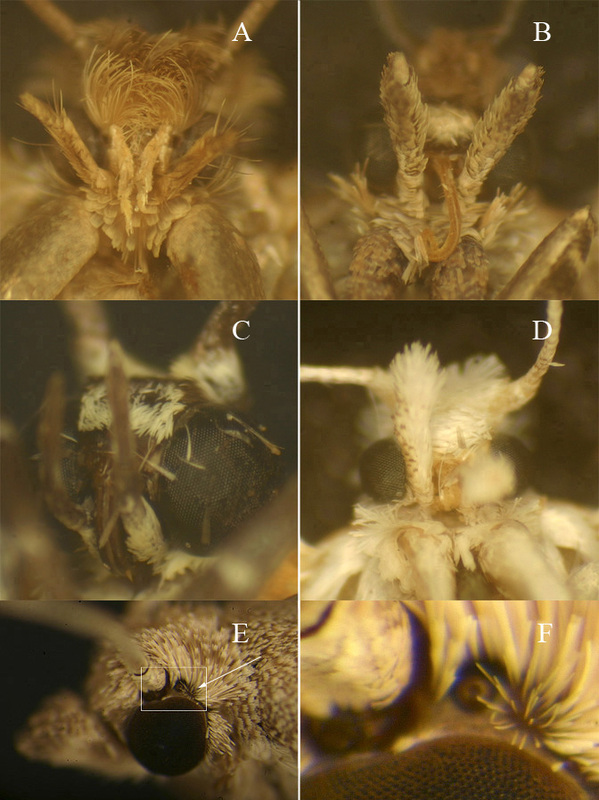 A, Tineidae, showing bristly labial palps between which lie the prominent, folded maxillary palps; B, Tortricidae, showing short labial palps, each with a small, clearly-differentiated, knoblike apical (third) segment; C, Yponomeutidae (Atteva), showing relatively long, narrow, upcurved labial palps; D, Yponomeutidae (Zelleria), in which each of the labial palps is short and somewhat tortricid-like but does not display a small, distinct, knoblike third segment; E, Tortricidae, entire head (chaetosema at arrow); F, closeup of the boxed area of Figure 1E, showing the chaetosema, a stellate formation of sensory bristles emitting from a low-lying wartlike protruebrance that lies immediately posterior to the ocellus on either side of the head. 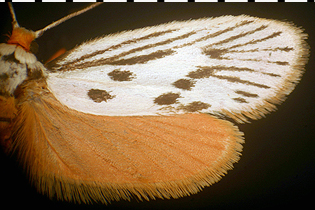 The chaetosema is widespread throughout Lepidoptera, sometimes on a hit-or-miss basis within a single family. In the discussion at hand, however, the chaetosema is diagnostically useful in that it is reliably absent in the superfamilies Tineoidea and Yponomeutoidea and is reliably present in Tortricidae. Figure 2. Abdominal "pelt" of male Zelleria celastrusella (pelt cut longitudinally, spread, and flattened on slide), with arrows indicating (a) transverse sclerotized bar on abdominal sternum 2, and (b) pleural lobes on abdominal segment 8, which character states are not seen in any microlep group outside the superfamily Yponomeutoidea. According to Heppner (2008), this genus is yponomeutoid but is properly placed in its own family, Attevidae. Wilson et al. (2010) noted that the single species that occurs in America north of Mexico is properly called Atteva aurea (Fig. 3); in the past, it has been referred to extensively as A. punctella or A. pustulella. Atteva aurea is common in Illinois. It is native to the Neotropical region and occurs in the Nearctic because it has tracked the spread of an introduced Asian plant, tree of Heaven, Ailanthus altissima (Simaroubaceae), which is its host plant in Illinois. The larva is a leaf feeder. As in the genus Yponomeuta (see below), larvae of A. aurea feed communally in a loose web on the underside of the host leaf, and pupation usually occurs in the web. This moth is unusual among yponomeutids occurring in Illinois in that it is multivoltine. The adult of A. aurea is very commonly seen nectaring on flowers of goldenrod, Solidago spp. (Asteraceae), in late summer. The color pattern on the forewing can vary considerably among different individuals, and some of the more divergent variants from the typical pattern shown here have been described as different species. Current thinking, however, is that all individuals of Atteva that are found in temperate North America are representatives of this single species. Figure 3. Atteva aurea. 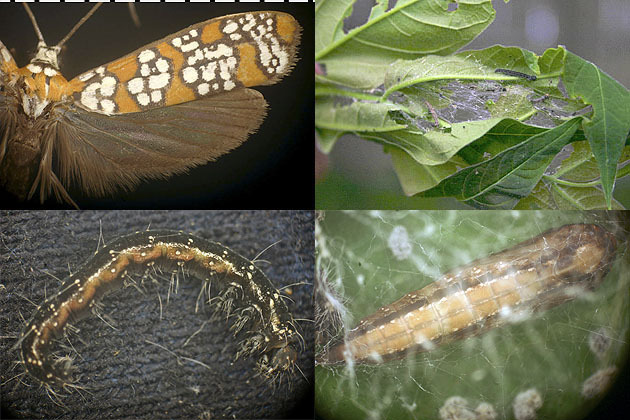 Top row: left, adult moth; right, larvae, web, and leaf damage caused by larval A. aurea on tree of Heaven, Ailanthus altissima (Simaroubaceae); bottom row: left, mature larva; right, pupa. This genus traditionally was placed in Yponomeutidae (including in the 1983 checklist), because of the similarity in adult coloration between Lactura spp. and some yponomeutids. This similarity, however, occurs via independent derivation, and Lactura is a lineage that is not properly included in the family Yponomeutidae, although, according to Heppner (2008), the genus is yponomeutoid. Presently, Lactura is placed in a separate family, Lacturidae. Six described species of Lactura occur in North America. Most of them are found only in the southern part of the USA. Lactura pupula (Fig. 4) occasionally is collected in Illinois. The known larval hosts are plants in the genus Bumelia (Sapotaceae), which is represented in Illinois only in the far southern part of the state. The larval biology of a population of L. pupula that appears to be established in northern Illinois (Putnam County) therefore is something of a mystery. Figure 4. Lactura pupula. Adult, collected at light. Two described species, S. caesiella and S. pyrella, occur in North America (Duckworth 1965). Both of them also occur in the Palearctic region, and both are recorded as feeding on leaves of birch, Betula sp. (Betulaceae), hawthorn, Crataegus sp. (Rosaceae), and cherry, Prunus sp. (Rosaceae). Swammerdamia caesiella (Fig. 5) is known from Illinois, with adults being collected from May through August. It appears to be rather uncommon in the central part of the state. Figure 5. Swammerdamia caesiella. Adult, collected at light. Seven described species are recorded from North America, including several species that have been introduced from the Palearctic region. Some of the latter (e.g., Y. malinellus, which feeds on apple, Malus pumila (Rosaceae), can be of economic importance. See Sperling et al. (1995) for more information. Generally, all of the Yponomeuta species found in North America are extremely similar on both external appearance and genital morphology, and in some cases, even molecular information can not be used to differentiate between species (Sperling et al. 1995). Therefore, rearing is the best (and sometimes the only) means of obtaining definitively-identified moths of Yponomeuta. Of the native species, Yponomeuta multipunctella (Fig. 6) is common statewide in Illinois. As is typical for the genus, the larva of Y. multipunctella feeds communally (at least in the early instars), with several larvae suspended in in a loose web on the underside of each infested host leaf. Late-instar larvae of Y. multipunctella, on the other hand, often adopt a solitary mode of life. Pupation occurs in a thin-walled ovate cocoon that usually is suspended within the web. In central Illinois, mature larvae occur from mid- to late May. Hosts are plants in the genus Euonymus (Celastraceae), including running strawberry bush, E. obovatus, and most commonly, eastern wahoo, E. atropurpureus. The larva evidently does not feed on the introduced species, winged euonymus, E. alatus. Figure 6. Yponomeuta multipunctella. 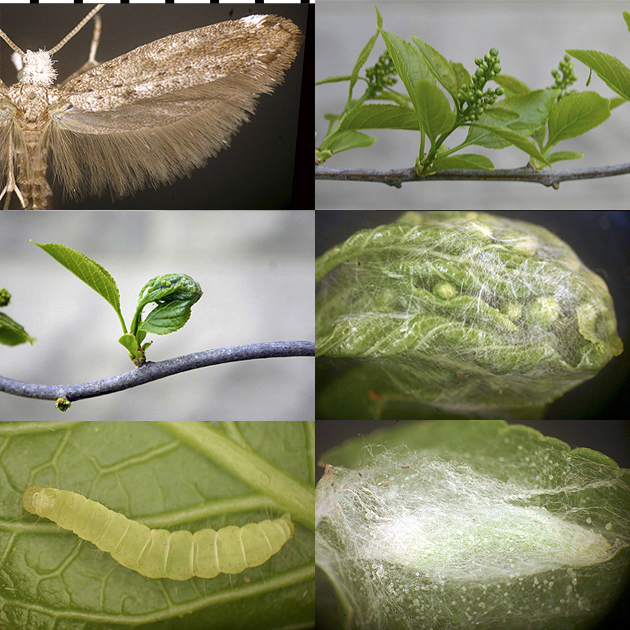 Top row: left, adult moth; right, mature larva in web on underside of leaf of eastern wahoo, Euonymus atropurpureus (Celastraceae); bottom row: left, mature larva; right, pupa in cocoon. Prays atomocella (Fig. 7) was included in Yponomeuta in the 1983 checklist, but on basis of biology and morphology, it clearly belongs in the genus Prays, as was recognized by Forbes (1923). It is the only native Nearctic species of the genus. The larva feeds on hoptree, Ptelea trifoliata (Rutaceae) in late April and early May (central Illinois). The larva lives and feeds as a borer inside a new shoot, which assumes a stunted, wilted, and darkened appearance as a result. In addition, the larva gnaws a small dugout into the woody stem adjacent to the base of the infested shoot, and the material thus generated is incorporated into a silken cover for the dugout, the entire structure forming a short tube that is external to the shoot itself (perhaps it is an escape chamber, for avoiding predators or parasitoids while they are investigating/probing the shoot). After the larva finishes feeding, it leaves the shoot (often going to the flower cluster of an adjacent shoot) and pupates inside a meshlike cocoon that is reminiscent of that of Acrolepiidae (and which may be reflective of recent common ancestry of these two lineages). 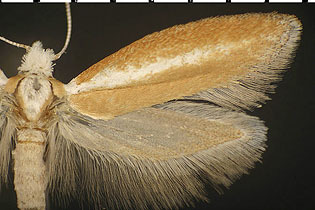 The mesh in the cocoon of P. atomocella, however, is composed of somewhat finer strands than those that make up the cocoons of Nearctic acrolepiid species of the genus Acrolepiopsis. Figure 7. Prays atomocella. Top row: left, adult moth; right, stem of hoptree, Ptelea trifoliata (Rutaceae) showing infested and uninfested shoots; middle row: left, closeup of woody stem at base of infested shoot, showing the silken cover of the dugout; right, partly-grown larva in shoot (one side of shoot removed); bottom row: left, mature larva that has left the shoot to pupate among an adjacent flower cluster; right, pupa in meshlike cocoon. Nine described species occur in North America; two are common in Illinois. Zelleria celastrusella (Fig. 8) feeds as a larva in late April/early May (central Illinois), on new shoots of bittersweet, Celastrus scandens (Celastraceae). The larva envelops the flower cluster and terminal leaves of the shoot within a copious amount of silk, and it lives and feeds (singly, not communally as seen in some other yponomeutids) inside the conspicuous "wad" that is so formed. At the end of larval life, it pupates inside a white silken cocoon that may be located either inside or (usually) outside the larval shelter. Figure 8. Zelleria celastrusella. 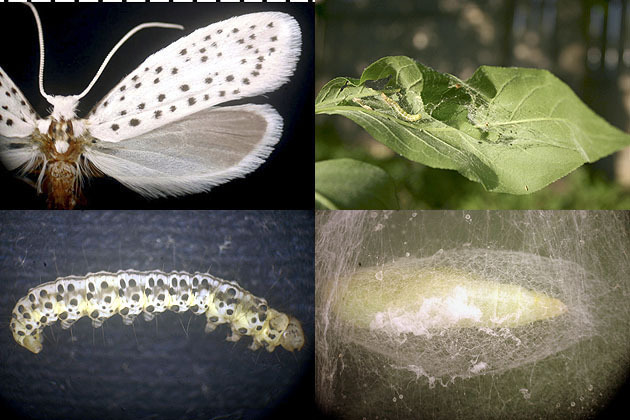 Top row: left, adult moth; right, normal, uninfested new shoots of bittersweet, Celastrus scandens (Celastraceae); middle row: left, infested shoot; right, closeup of infested shoot, showing the extensive amount of silk used in tying the shelter; bottom row: left, larva (removed from shelter for photo); right, cocoon. The larva of Zelleria haimbachi (Fig. 9) feeds on webbed-together leaves of pines, Pinus spp. (Pinaceae). The adult appears at light in June, in areas of Illinois where pines occur. Figure 9. Zelleria haimbachi. Adult, collected at light.